In December 1992 Toyota’s very first Carina E rolled off the production line in Burnaston, Derbyshire. It was the first British-built Toyota and, to celebrate its twentieth anniversary, the company is seeking the oldest surviving example still in daily use. According to DVLA records there are more than 17,000 Carina models still in regular use, even though production stopped in 1997. Toyota is interested in the earliest cars, which were built in 1992 and would wear K registration plates. According to our MOT Files around 1500 1992 Carina Es were taken for an MOT test last year and of those around half passed - so there are still quite a few survivors. The biggest causes of failure among them were easy to fix issues like light bulb failures, so the Carina E has stood the test of time. If you own a K-reg Carina E you can check if it is a British-built model or one of a few imported from Japan by looking at the the VIN plate, which is located under the bonnet near the windscreen wiper. If the code starts with S it’s a British-built car, while J indicates a Japanese one. Owners of the oldest examples will be invited to tell the car’s story and have it photographed. They will also be in with the chance of winning a week with the all-new upcoming Auris, which was first shown at this year's Paris Motor Show. 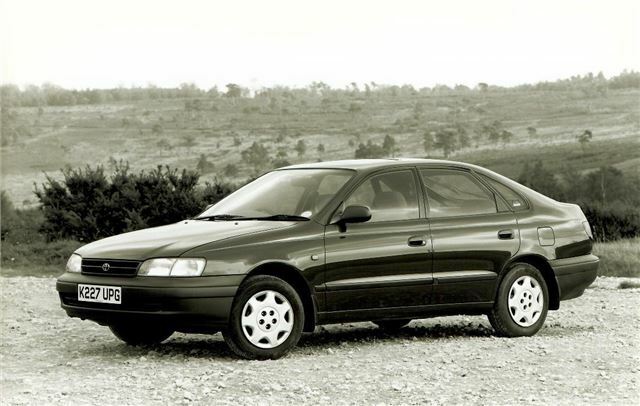 If you spot a K-reg Carina or you know the owner of one, Toyota asks that you let them know of the search, even if only by leaving a note on the screen. If you’d like to let Toyota know about an early example of the Carina E, email Toyota.contact@tgb.toyota.co.uk. You can also share your Carina E stories, sightings and photographs via social media on Toyota’s Facebook page or by using the Twitter hashtag #FirstGBToyota. Remember to get the owner’s permission before sharing pictures of their car.